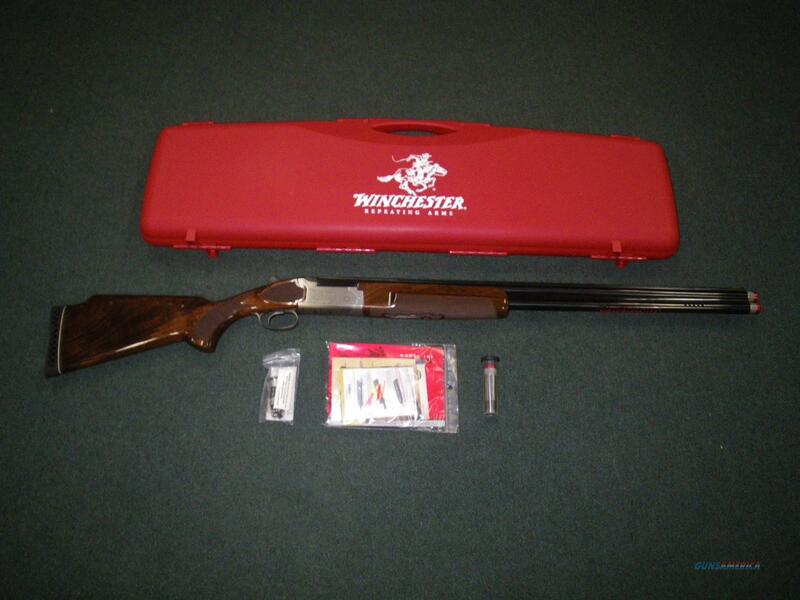 Description: You are bidding on a new Winchester Model 101 Pigeon Trap in 12ga with a 30" barrel and 2-3/4" chamber. This deluxe trap gun is ready to dominate the field with sought-after extras straight from the box. A wide 10mm steel runway rib, mid-bead sight and TRUGLO TRU-BEAD interchangeable fiber-optic front sight offer a truer, more technical sight picture. The lightweight barrels are highly polished and feature porting and vented side ribs. An adjustable trigger shoe fine tunes length of pull. It comes with an adjustable comb that allows individual height and cast on/off customization in seconds, carved from beautiful Grade III/IV walnut. It features the Invector-Plus choke system and .742" Back-Bored Technology that is world renowned for ideal shot patterns. It also comes with Signature Series Extra-Full, Full and Improved Modified chokes. A molded ABS hard case is included. Displayed images are stock photos. Any questions please feel free to ask (our phone number is in the additional information tab above).